Select Start | Settings | Taskbar & Start Menu settings. In the Taskbar & Start Menu settings dialog box, on the General tab, check and uncheck boxes as shown below. Checking "Show small icons in Start menu" reduces the size of the icons from 32 x 32 pixels to 16 x 16 pixels. Big icons just make your start menu take up more space on the screen. Unless you need big icons because of poor vision, check "Show small icons in Start menu". Make sure "Use Personalized Menus" is unchecked. This option hides infrequently used items on the Start Menu. Just because you infrequently use them doesn't mean you want them hidden from you. If an application is hidden from you, it definitely will remain infrequently used! This option is a bad idea. 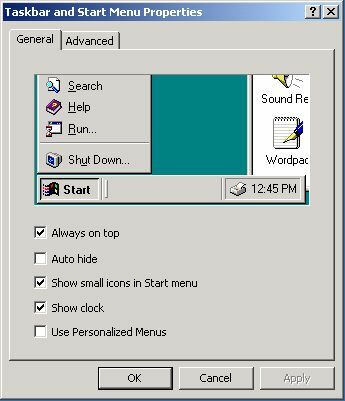 Later in this series of articles, I'll show you how to manage your Start menu without hiding things from yourself. In the Taskbar & Start Menu settings dialog box, on the Advanced tab, check and uncheck boxes as shown below. Note that I have left all except the first item unchecked. Displaying Administrative Tools in the Start menu is just my personal preference. If you are a system administrator, you want as many access points to the Administrative Tools as you can get. The Administrative Tools are also available in My Computer and Control Panel, so you don't really need them on the Start menu too.